Barack Hussein Obama, Junior is a Warmonger. There's no doubt about it, none. He is actively trying to prolong the War in Iraq and keep U.S. Soldiers there longer than necessary. What other definition is there of a warmonger? Thus, the 2010 deadline fixed by Obama is a meaningless concept, thrown in as a sop to his anti-war base. Prime Minister Nouri al-Maliki and the Bush administration have a more flexible timetable in mind. Obama has given Iraqis the impression that he doesn't want Iraq to appear anything like a success, let alone a victory, for America. The reason? He fears that the perception of US victory there might revive the Bush Doctrine of "pre-emptive" war - that is, removing a threat before it strikes at America. Obama claims he once considered joining the military but didn't, because, "the Vietnam War had come to an end. We weren't engaged in an active military conflict at that point. And so, it's not an option that I ever decided to pursue." Let's recap. Here is a U.S. Senator on foreign soil attempting to dictate foreign policy by delaying and impeding any U.S. Troop reduction in Iraq for what he believes will benefit his political destiny in his selfish quest for the White House. Charge Obama with violating The Logan Act which prohibits citizens to confer with foreign governments against the interests of the United States. 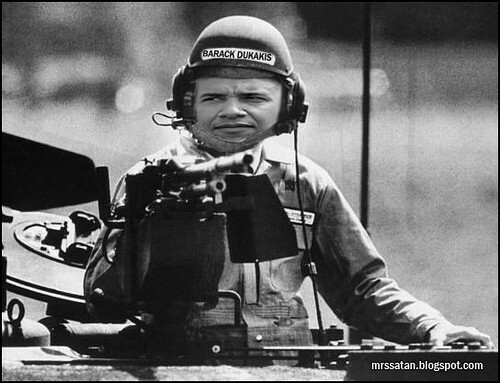 Obama wants to keep the war going for his own political purposes. Ask his Cult Followers what they think of this. Oh, I imagine they're too busy burrowing down into a newfound layer of denial. They wouldn't dare tell the truth that their messiah is a warmonger.